This vanity is a great way to add classic style to your bathroom. With a beige tan marble counter and white solid wood base, this product is good-looking and useful. Made with a roomy double-door cabinet, this vanity has lots of room to keep items like toothpaste, towels, and hair brushes. This classic set from Wyndham Collection will make your bathroom look brand new. Andover 36-inch W 2-Door Freestanding Vanity in White With Marble Top in Beige Tan With Mirror This vanity is a great way to add classic style to your bathroom. With a beige tan marble counter and white solid wood base, this product is good-looking and useful. Made with a roomy double-door cabinet, this vanity has lots of room to keep items like toothpaste, towels, and hair brushes. This classic set from Wyndham Collection will make your bathroom look brand new. 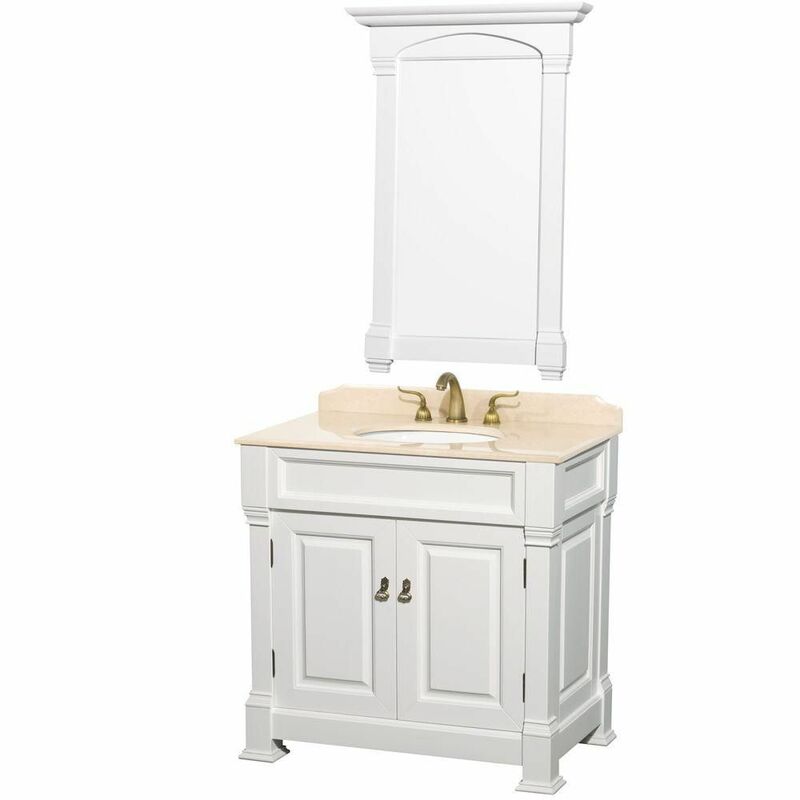 Andover 36-inch W 2-Door Freestanding Vanity in White With Marble Top in Beige Tan With Mirror is rated 4.3 out of 5 by 9. Rated 5 out of 5 by Peter from Good materials and well packaged. Arrived in excellent condition.... Good materials and well packaged. Arrived in excellent condition. Rated 1 out of 5 by Terry from The Vanity arrived damaged for the SECOND time over 5... The Vanity arrived damaged for the SECOND time over 5 weeks of effort, delays and additional costs related to the delay of installing this vanity as part of our home remodel due to flooding.Please contact me immediately to resolve this issue. Rated 5 out of 5 by Remodel from Beautiful!... Beautiful! Rated 5 out of 5 by HomeDepotCustomer from Beautiful vanity and top! The vanity is on the taller side (35") which works for us. The marbl... Beautiful vanity and top! The vanity is on the taller side (35") which works for us. The marble top is beautiful and I love the shape on the back splash. The mirror (which comes included) is very nice but was too long for our space. Still a great value for the quality. Very happy! Rated 5 out of 5 by Dan from Beautiful! We haven't installed this unit yet, but the workmanship on the cabinetry is EXCELLENT. I ordered the "white" marble top and it is white, but mostly dark gray throughout. I would have like it to have been more an "all over white". I wish I could just send back the top and order another one. You will not be disappointed in the workmanship of the cabinet. Oh, not going to use the mirror, but it is made well.